Paper? Excel spreadsheets? You’re gonna trust your entire operation - millions of dollars on the line - to a spilled cup of coffee or an un-traceable spreadsheet altered by a disgruntled employee? Seriously? Mysticetus automatically tracks (via GPS, AIS and other methods) all vessels and aircraft. Observers securely record everything that happens in the field. Vessel operational status, equipment being used, environmental information, animals sighted and tracked. All data is automatically time-stamped, securely encrypted and stored, recording who changed what and when (full audit capabilities). Animal sightings are accurately determined, tracked and future location predicted. Critical species sightings (e.g. North Atlantic Right Whale) are shared instantly among all nearby Observers. (hint: Government regulators love this type of thing). Observer Photos are automatically associated and recorded with the proper sighting record in the database. 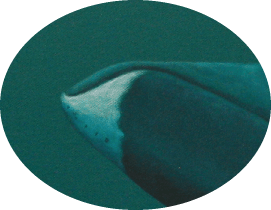 This simplifies species identification validation (“was that seriously a critical species or just another tursiops?”). Consistent Report generation at the push of a button - from all environmental contractors. Mysticetus standardizes and coordinates reporting. Replay functionality allows revisiting a survey during any point of time in the past. This creates the situational map at that time - confidently provide evidence of exactly what happened and when. Human Error and ambiguity can cost you millions in preventable shutdowns. If an animal is plotted incorrectly, an observer may shutdown your project for hours or longer. You could even lose your permit to operate. Mysticetus is your insurance policy against such human error, providing a wide array of instant QA features to help observers do it right. Heads-up map display of all sightings, tracks and predicted locations relative to vessels and exclusion zones. If the animal does not show up on the map where it “should” be, the observer is instantly notified. Critical species seen from other vessels or aircraft are plotted in real-time on the heads-up map. Observers instantly see where animals are, precisely. No more error-prone radio calls (“The whale is really close to you, well, maybe kindof close, actually, we’re not 100% sure so you better shut down operations for the day!!”). One Button Reports summarize the events of the last hour, shift or day. Anomolous data (animals too far, incorrect species IDs, etc.) are easily highlighted. 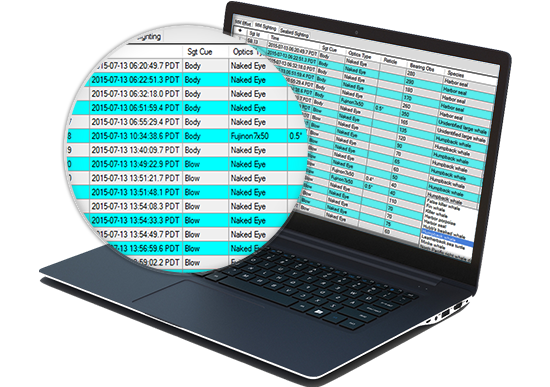 Project managers - anywhere on the planet - can remotely monitor and double-check observer decisions with the Mysticetus Command Center. Human errors are quickly caught, in the field, in real-time, before they can do serious, costly damage to your operation. Mysticetus is unique in that it supports data collection and mitigation decisions from any platform: Marine, Aerial or Terrestrial. All platforms are synchronized and plotted on a heads-up map and can participate in the Mysticetus Command Center. Animal sightings and alerts are appropriately shared no matter the platform - land, sea, air. Vessel-based operations integrates with infrared cameras, reticle binoculars and other boat-oriented tools. Aerial-based operations integrate with standard inclinometers, packet radio comms, and other airplane-oriented tools. Terrestrial-based surveys use reticle binoculars and/or theodolites - including automated data integration with TopCon/Sokkia models including older DT5/DT10-series and the modern DT-200 series. Never again worry about backing up observer data. Never worry about whether it is on some hard drive or Sharepoint or Dropbox or in some email. And, of course, never worry about someone spilling a cup of coffee on your paper forms. All Mysticetus data is securely and automatically stored in the Mysticetus Cloud - a geo-distributed Content Management System (CMS). Updates, edits and versions are all time-stamped, logged and archived. Backups are automatic. Data is automatically geo-distributed around the globe. With the appropriate passwords, data can be retrieved from anywhere. Even without internet, Mysticetus backs up data every possible place it can, including SD cards and any attached hard drives. At some point when even the smallest sliver of internet access is found, Mysticetus automatically submits the data into the Mysticetus Cloud CMS. Let us show you how Mysticetus can greatly improve your next project with a personalized walk-through.